So you’re sitting there at home, despressed because you have to work in early May and can’t make it to the National Genealogical Society Conference in Richmond? 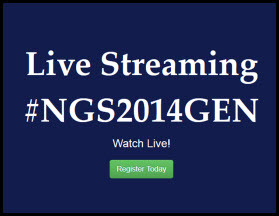 Technology is going to bring a part of the NGS conference right into your home. Some of the biggest names in genealogy, some of the hottest topics in national and Virginia research! And the best part about it? You can watch live or after the fact, as many times as you want, for 90 days afterwards. It doesn’t get a whole lot better than that. There are going to be two live-streamed tracks. Each will cost $65 for NGS members and $80 for non-members, or you can bundle the two together for $115 for NGS members or $145 for non-members. Registering gets you the right to watch the presentation in real time — and as many times as you want until 10 August 2014. So what about those of us who will be in Richmond, but may have to miss some or all of these presentations because of time conflicts? NGS is taking care of us too. Attendees can also register for the live streaming, and watch these lectures as many times as we want until 10 August 2014 as well. More information is on the conference website here — and you have to register by 30 April to get in on this. Bottom line: even if you can’t go to NGS, let NGS come to you. This is too good a deal to pass up.